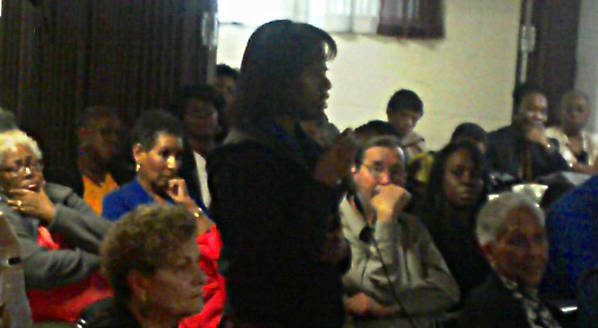 Members of the Rockland, NY, community listen to a contribution by a participant of the public forum. Spring Valley, NY. (Abeng News) – The Rockland community of New York state, is using the police killing of 17 year-old Michael Brown, August 9, in the small town of Ferguson, Missouri as a wake up call. Some 150 persons gathered at the First Baptist Church, Rev Dr. McWilliams Way (Hoyt Street) in Spring Valley, New York, on Saturday afternoon, (September 13) for a public forum in the village in the Hasidic-dominated enclave of East Ramapo, which has a predominantly Haitian and Latino immigrant population. More than two weeks of protests, some violent, followed the killing of Brown, who is black, by a white police officer, in what some considered an incident of racial profiling. The National Guard was called out by the state governor, prompting criticisms of unleashing war on the domestic population. The Sprng Valley panelist included Wilbur T. Aldridge, director, Mid-Hudson, Westchester NAACP; Ashley Okonkwo, educator, community service volunteer; Louis Falco, Rockland County sheriff; Ashly Dawson, community activist; Reverend Dr. Weldon McWilliams IV, associate minister First Baptist Church, Spring Valley. The moderator was Kenneth Mercer, Rockland County community leader. Attendees reflected the diversity and generational depth of the county raging from pre-teens to elders who have exceeded “three scores and ten” and included Africans, Europeans and Mesoamericans. The discussion was far-ranging and intense. The law enforcement representatives were pressed to answer questions about police training and the culture of violence, which the community members perceive, pervades police departments in Rockland County. County sheriff Falco and Sgt Noelizaire of the Spring Valley Police Department (SVPD) were at pains to defend the adequacy of the training that local police personnel receive and to deny the existence of a culture of violence perceived to exist in the police departments all over the county. But the cheerful view they strove to paint was starkly contradicted by recent events including the December 2011, slaying of Herve Gilles, a Haitian immigrant believed to be of unsound mind and by the assumed racial profiling, by Ramapo Police officers assisted by a member of the Suffern Police Department, of a group of black parole officers who were riding in an unmarked vehicle. This latter incident, which took place in April 2014, has resulted in claims that the parole officers were terrorized by the police officers and made to fear for their lives. McWilliams’s words were especially poignant against this backdrop. He reminded the audience that it is only through organized and determined action, on the part of all people, that institutionalized racism would be defeated. The conference ended with an affirmation that the dialogue will be continued. Aduku Addae writes on social, political and cultural matters from upstate New York.